I don’t really have a snappy introduction to start off this post, so I’m just going to jump right into it. I’m pretty sure I don’t need to tell anyone about the benefits of Amazon, mainly that they sell just about anything you could ever want for a great price. But in addition to their regular low prices, Amazon has a whole slew of deals you can find on the Today’s Deals page. These deals can be really amazing, sometimes up to 75% off the list price of the item. And they’re only valid for that one day so you need to know it’s there to take advantage of it. Now I’m guessing you can’t visit Amazon every day to see if the deal is something you’re interested in, but there are several different ways you can be alerted to them, from email to social media to mobile apps. 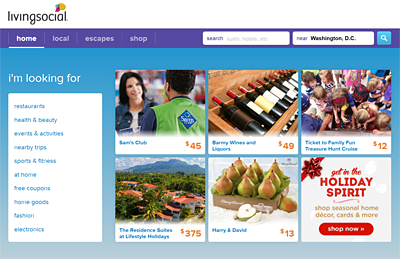 Click the arrow at the top right of the deals page to choose your preferred method. Just below the daily deals, lightning deals are usually only available for 3-4 hours and some of the most common categories are jewelry, clothing, baby products, toys and games, and cameras and accessories. There’s a dropdown list at the top right to filter by category as well. In addition to the time limits, there are quantity limits for these deals as well. And some of them sell out within 5 minutes of going on sale! The good news is that they show you what sales are coming up throughout the day, although they don’t tell you what the deal price is until it actually goes on sale. What I do is check what’s coming up and then put a reminder on my calendar to check back right when they go on sale. The other good news is that Amazon added a new benefit to their Prime membership program recently. If you’re a member, you get a half-hour head start on a lot of the deals, which can make a big difference for those items that really fly off the shelves. If you’re not a member, you can sign up for a 30-day free trial here, which includes other benefits like free 2-day shipping, thousands of free streaming videos, and a million streaming songs. Keep scrolling down the Today’s Deals page and you’ll find all sorts of other special offers, including digital products, local deals, and coupons. You can also find some terrific discounts on Amazon’s Outlet Deals page, which includes markdowns, clearance items, overstocks, and more, and its Warehouse Deals page, which offers open-box, like-new, and pre-owned products backed with Amazon’s return policy. 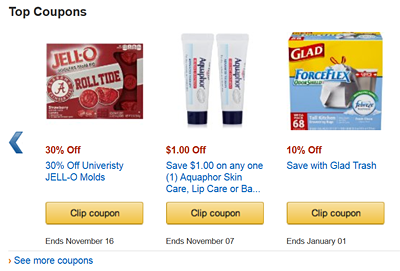 In addition to the many deals above, there are other ways you can save when buying from Amazon. I’ve already mentioned Amazon Prime and its free two-day shipping option. But if you don’t want to join Prime, you can still get free standard shipping for orders of qualifying products over $45. And if you want to buy something that doesn’t meet that threshold and aren’t in a rush for it, you can keep items in your cart for 90 days (and can move items to Save for Later to keep track of them for longer). If there are items you purchase on a regular basis like groceries, cleaning items, or beauty products, you can use Amazon’s Subscribe and Save service to get up to 15% off your order plus free shipping on every order. Trade in DVDs, CDs, video games, electronics and books for an Amazon gift card, even if you didn’t buy them on Amazon. Do you collect American Express membership points? If so, you can use them to pay for your Amazon purchases. 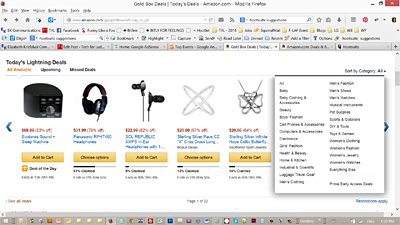 Just sign up with the Shop with Points program to link your Amex account to Amazon. Then when you go to check out, you’ll be given the option to use points to pay for all or part of your purchase. 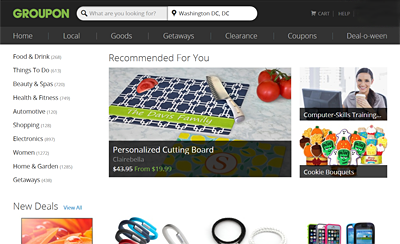 Groupon and LivingSocial are similar services. A minimum number of people need to purchase vouchers for their deals, which include activities, events, getaways, professional services, and all sorts of products within a given amount of time. (You pay upfront and if they don’t meet the minimum, they refund you the money. ) I don’t think I’ve ever seen a case where the minimum wasn’t met, but I guess it’s possible. A lot of the deals are for services at physical locations (e.g. restaurants, spas, cleaning services, etc.) so when you sign up you select from a list of cities. But you can purchase from other cities for friends (or for when you travel) and there are lots of deals that are available nationwide. Tip: If you try to get tickets to a local event through its own website and it says the event is sold out, check on Groupon or LivingSocial. Some times they still have tickets available (plus you’ll get a better price on it!). GoldStar is purely for events and is available for 35 cities/regions around the U.S. It’s more a straight discount site, but the discounts can be great. For example, the regular entrance fee for the Newseum in Washington D.C. is $24, but you can get it for $18 (including service charge) at GoldStar. For a lot of events, tickets are only available for certain days and times and you usually need to buy them more than a day in advance. Standard membership is free and there’s a paid upgrade available that gives you benefits like a 4-hour hold on tickets, priority seating, and credit if you need to cancel your reservation. 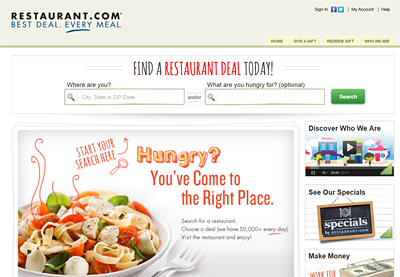 Restaurant.com is a website where you can purchase gift certificates for 50,000 restaurants around the U.S. at a huge discount. You simply type in your location and you’ll get a list of participating restaurants and the certificates available. 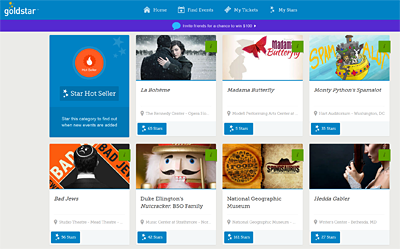 You can filter by cuisine, price, meals served, and other criteria. 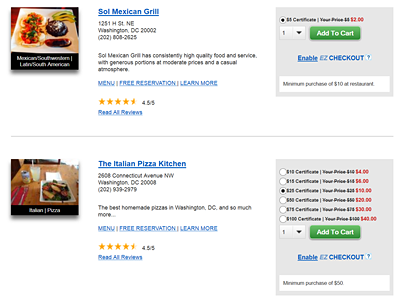 The screenshot below shows two results for restaurants in the Washington D.C. area. The first one just offers one certificate ($5 value for $2) while the second one offers several from $5 value for $2 to $100 value for $40. Most of them have some minimum purchase restriction. If you sign up for their mailing list, you can occasionally get even higher discounts. I’ve gotten a number of $25 certificates for just $2—an amazing deal! Obviously, a lot of the most popular restaurants in a city will not be listed here. But I find it’s a great way to try new restaurants out or to find places to eat when I’m traveling out of town. Technically you’re not “saving” money with Ebates. 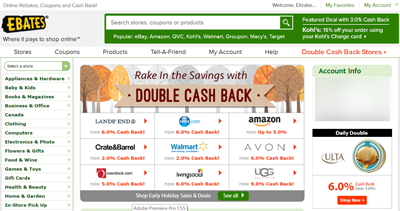 Instead you get cash back when you shop at online stores using their links to get there. And we’re not talking about rinkydink stores you’ve never heard of; you can get cash back from a lot of places where you’re probably already shopping including Macy’s, Target, Toys R Us, The Body Shop, Crate & Barrel, Lowe’s, and hundreds more. You can even get cash back for shopping at the places listed previously in this post: Amazon, Groupon, LivingSocial, and Restaurant.com! 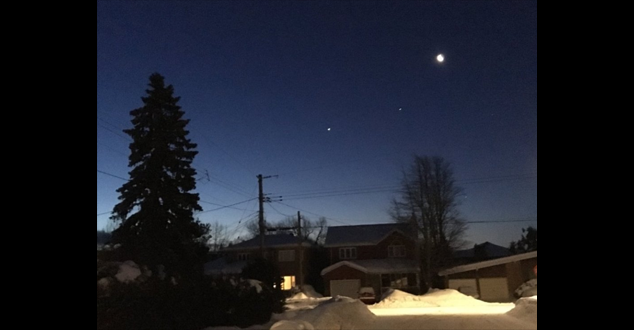 There’s also a Canadian Ebates program that includes Canuck-specific stores like Indigo, Marks, and Addition Elle in addition to many international merchants. 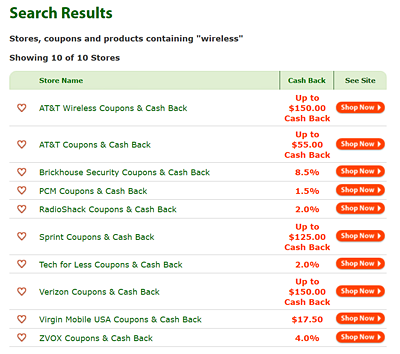 The cashback amount varies by merchant and may be restricted to specific products or categories. 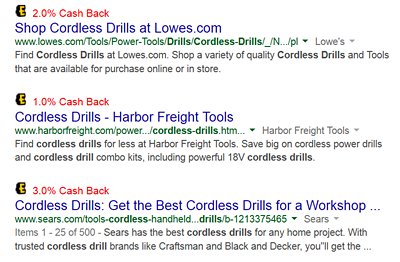 There are frequently double cash back offers, which you can learn about with email alerts, and you can still take advantage of any sales and promo codes that the merchants are offering. In fact, the Ebates site actually lists special offers for each merchant itself, making it kind of a one-stop shop to get the best deal you can. Tip: If you’re thinking of getting a new cellphone, I highly recommend you visit Ebates first; you can get up to $150 cash back at major carriers for some plans.